A century has passed since the historic victory for women’s rights, when the Representation of the People Act confirmed their right to vote. But, 100 years on from the legislation’s acceptance, there are still doubts over whether gender equality has truly been achieved or if there is still a long way to go. In the hope of shining a light on this ever-present topic, theEword is set to mark International Women’s Day for the second year running with a temporary rebrand to ‘theSHEword’. The special week-long campaign will kick off on Monday 5th March and involve an overhaul of the logo, website and social media channels to reflect Pantone’s colour of the year – ultra-violet. Some of the team will also be dyeing their hair purple – one of the official colours of the Suffragette movement. Here, we bring together some of the people who have driven theEword’s pro-women rebrand to discuss the position of women in the 21st century, why the campaign holds a special place in their hearts and what their hopes are for the future. "I support theSHEword because, well, why wouldn’t you? I grew up with strong female role models. Women that I looked up to as a child and look up to even more now I’m an adult. Growing up, the concept of inequality between the sexes just did not exist in my family. 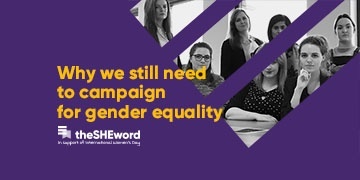 In my professional career, sadly, I’ve seen sexism at play but fortunately, I have seen far more examples of fantastically talented women, women who deserve the support of campaigns such as theSHEword that will, as far as its scope will allow, further the cause."